MPC's Rigid AlumaMark blank labels and tags allow you to create custom creations with vivid backgrounds using your CO2 laser. Available in a rainbow of beautiful hues and finishes, AlumaMark is ideally suited for name badges, trophy plates, equipment labels, property tags, and many decorative interior applications. MPC’s rigid AlumaMark blank labels are strong and lightweight. The thicker aluminum will not tear and offers greater impact resistance. AlumaMark blank labels are tags are manufactured using a proprietary coating bonded to an anodized aluminum face stock. A protective coating may be applied for increased durability. Not recommended for outdoor use. Why Choose MPC's Rigid AlumaMark Blank Labels & Tags? Creates unique labels and tags on demand for use in name badges, trophy plates, equipment labels, property tags and decorative applications. Produces rich black graphics on a wide selection of color backgrounds and finishes. Requires only low power settings on your CO2 laser. Anodized aluminum face stock accepts optional protective coatings for increased durability. High-performance adhesives and/or holes for mechanical attachment. .020" anodized aluminum face stock. Matte (non-reflective with flat finish), Satin (lustrous semi-reflective material), Mirrored (highly reflective, gloss appearance). Note: Finish options may vary by material thickness. None. 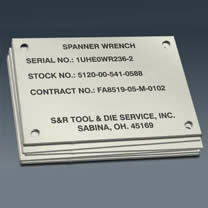 Labels are blank for on-site marking. Produces rich black graphics. Matte Silver, Satin Silver, Satin Gold, Satin Bronze, Satin Brass, Satin Red, Satin Yellow, Satin Orange, Satin Green, Satin Blue, Mirrored Silver, Mirrored Gold. Note: Color options may vary by material thickness. Standard and custom sizes up to 20" x 24" available.